Shangri-La Toronto ‹ Rovey Banquet Services Inc.
Toronto’s striking cityscape unfolds before you, a feast for your eyes. You recline in a plush sofa in your spacious suite at Shangri-La Hotel, Toronto. From this vantage point, you gaze upon the gleaming city that is Canada’s largest metropolis. For meetings and social events, the third floor with its eight meeting rooms, presents one of the city’s most unique hosting opportunities. Encompassing 1,359 square metres (14,626 square feet) in four distinct areas, the spaces are easily connected via two central corridors to create a floor that flows. The event rooms, named after prominent Toronto destinations, include a 42-seat screening room with over-sized chairs, an 16′ x 13.5′ foot screen and state-of-the-art sound system; and a two-storey glass room, Museum, set with 13 Italian crystal chandeliers, hanging at varying heights. The outdoor garden terrace, with views of University Avenue, which can enhance and extend the ballroom capabilities or an outside ceremony site. The largest space, Queen’s Park, offers 341 square metres (3,670 square feet) of open space, which can be divided by an air-wall. Over-head, 39 pave crystal chandeliers. Centre pivot doors open to a glass wall and an outdoor garden terrace overlooking University Avenue, enhancing and extending the ballroom capabilities. 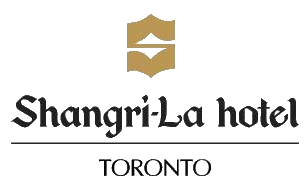 For a comprehensive tour for the extraordinary brand name hotel, please contact David Robitaille at (647) 788-8878 or david.robitaille@shangri-la.com .